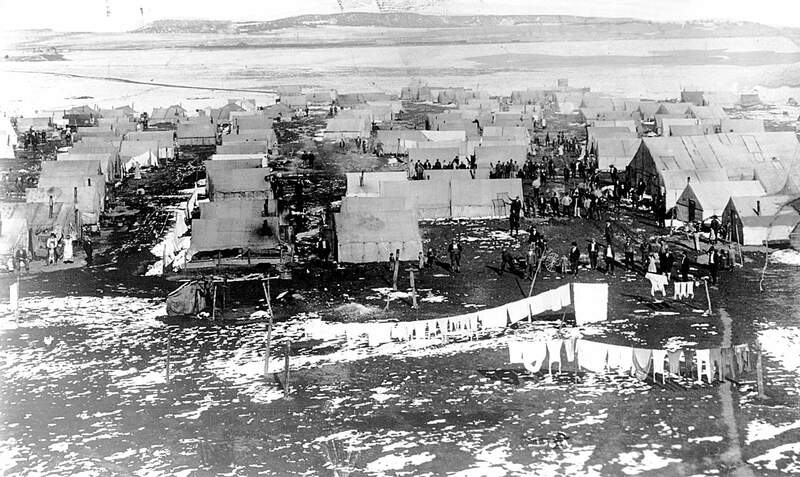 On April 20, 1914, in Ludlow, the Colorado National Guard shot striking miners with machine guns, killing 17 of them, and then burned the miners’ tent colony to the ground, suffocating 11 women and two children. This photograph shows the remains of the tent camp in Las Animas County north of Trinidad. An immigrant woman, possibly Italian, stands beside her tent as deep snow covers the ground in Las Animas County. Immigrant miners in Ludlow sought better safety, working and living conditions with their strike against Colorado Fuel & Iron Co. of Pueblo owned by John D. Rockefeller. 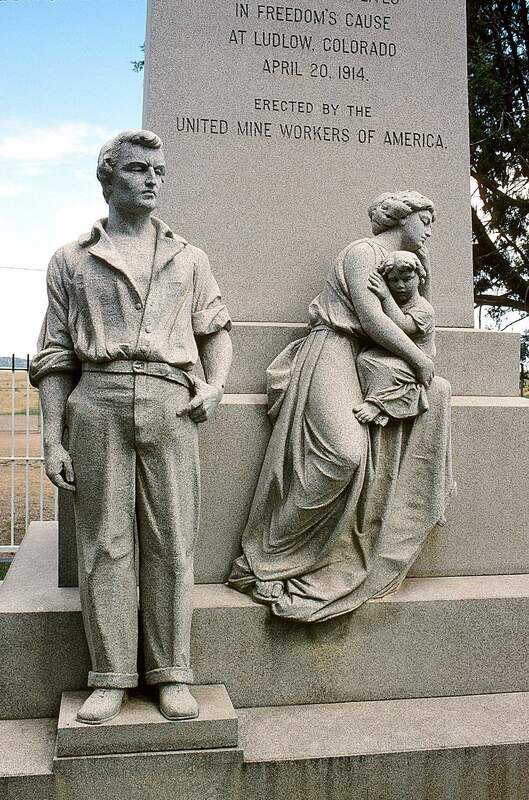 The United Mine Workers of America erected this marble statue at the Ludlow Massacre site. The Ludlow strike and subsequent deaths of miners, women and children brought national attention to the plight of labor in America before World War I. 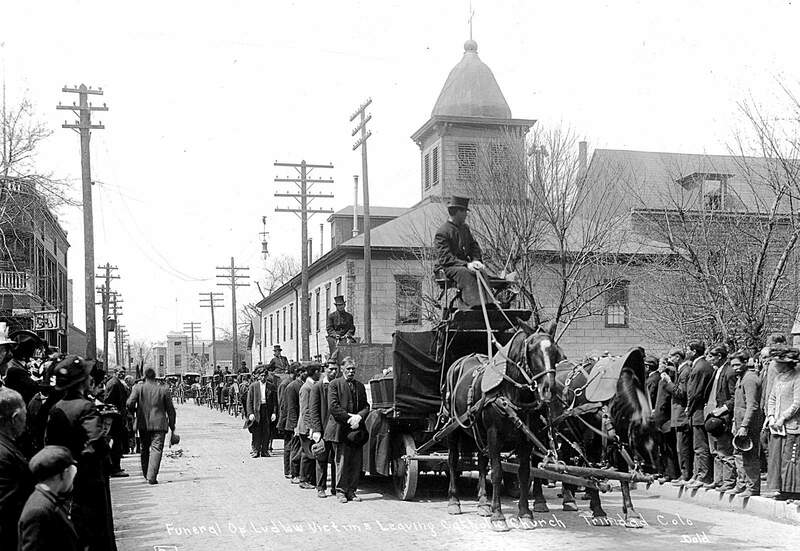 A funeral procession for Ludlow victims leaves the Catholic church in Trinidad. Contributions poured in from across the nation from laboring men and women for the funerals of miners and their families who died at Ludlow. 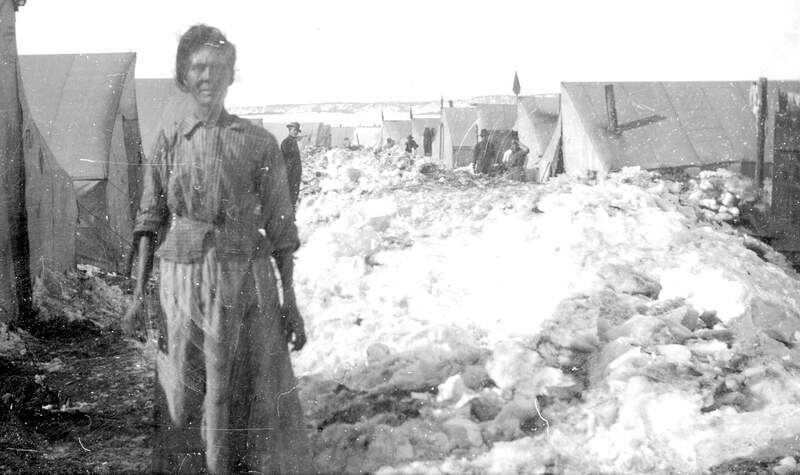 Miners and their families in the Ludlow tent colony endured a bitterly cold winter in 1913-14. 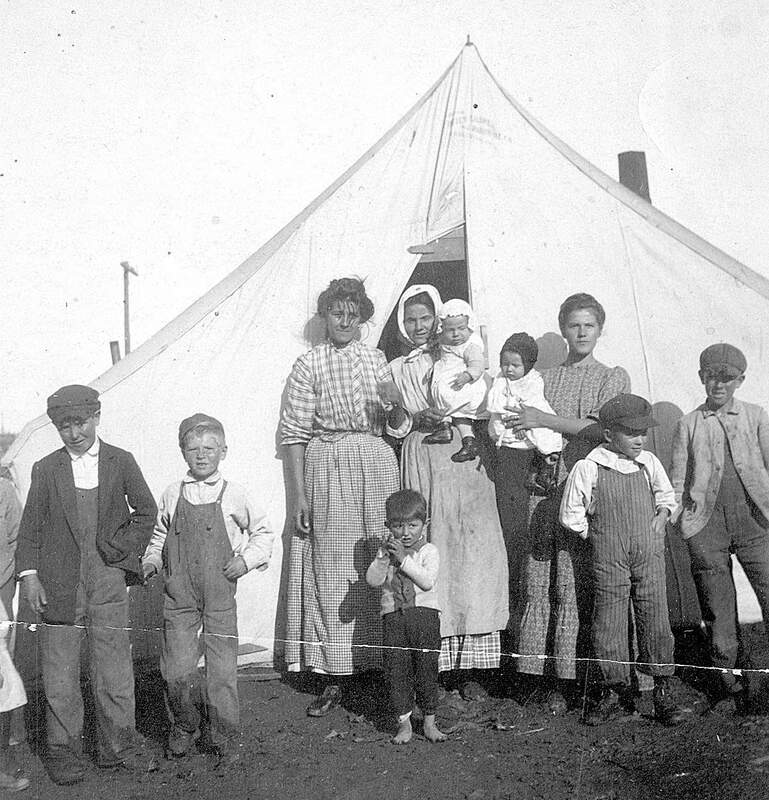 The wives of striking coal miners and their children stand outside their tent at the Ludlow tent colony, which would become a massacre site. Historical archaeology has revealed much about camp life and how immigrants dug shelters under their tents for storage and for safety. 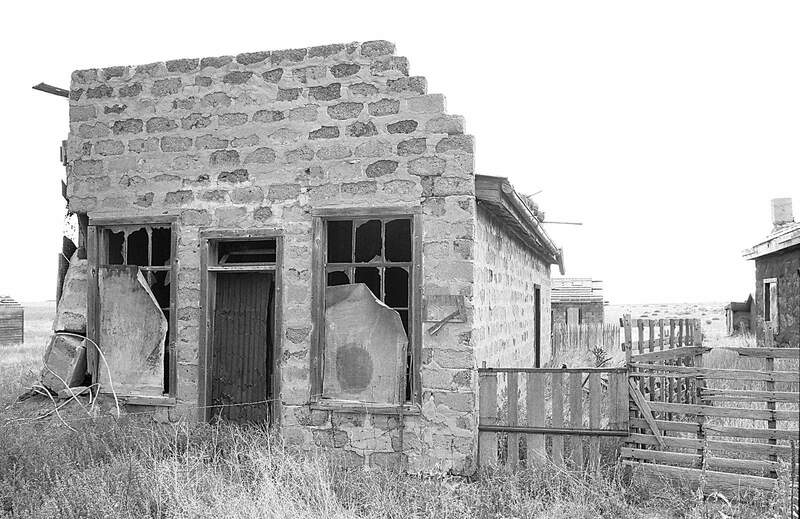 The Ludlow site has a few abandoned buildings, such as this one photographed in 1997 along the railroad tracks, but almost nothing else remains there. At the turn of the 20th century, Colorado offered better protection for the donkeys and mules that worked in mines than for the miners themselves. Mules and donkeys were mandated by law to spend a month each year out of the mines so they would not go blind. Miners, however, had few safety provisions, could not easily join unions and saw their wages steadily decreased. Coal mine explosions had killed dozens, but at Ludlow there would be a different kind of tragedy. 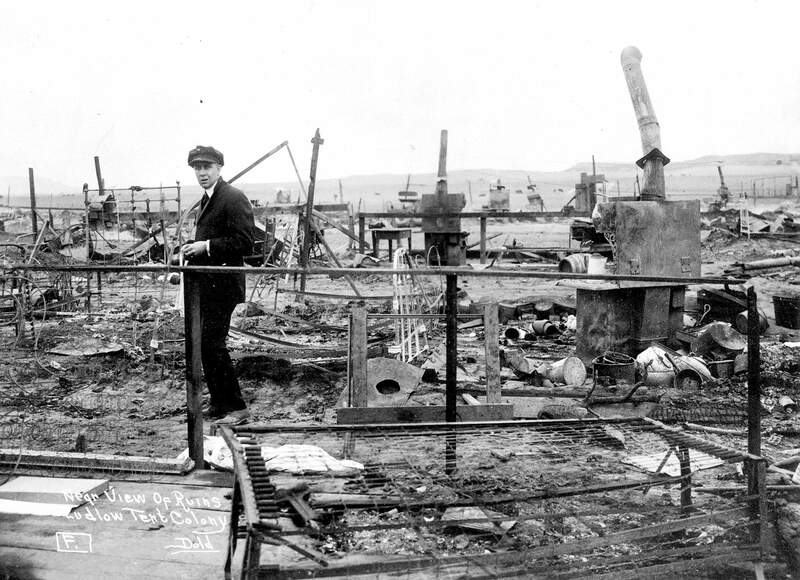 On April 20, 1914, the Colorado National Guard shot striking miners with machine guns, killing 17, and burned their tent camp to the ground. Eleven children and two women suffocated and died at Ludlow in the low hills in Las Animas County. Health and safety issues were difficult in the gold and silver mines of Colorado’s high country, but in southern Colorado’s coalfields, tensions were even worse because of dangerous methane gas in coal shafts. Near Trinidad and Walsenburg waves of Greeks, Mexicans, Croatians, Hungarians and southern Italians dug coal under unsafe conditions and were crowded into company housing. The United Mine Workers of America sought to improve living and working conditions for these newly arrived immigrants, but mine owners would not budge and eventually used their power with Colorado Gov. Elias Ammons to call out the Colorado National Guard. In the southern Colorado coalfields, “immigrant miners lived with their families in company houses, bought the necessities of life in company stores, sent their children to company schools and churches, and experienced the power and influence of company executives,” says McGovern. The striking miners endured the freezing winter of 1913-14, deep snow and near starvation as union funds grew low to support them. Nothing remains of the charred tent camp at Ludlow. A few old wooden buildings crumble near the former Colorado & Southern Railroad line. But dominating the Ludlow Tent Colony National Historic Landmark is a marble statue of a miner looking outward and a woman tightly holding a child to her chest. The statue is a moving symbol made all the more meaningful by the empty landscape and the soft sound of the wind moving across prairie grasses. What’s missing is the deadly sound of mine explosions that motivated strikers a century ago. On Jan. 31, 1910, a “ball of flame” blew out of the Primero mine where 77 men and adolescent boys worked. There were no child labor laws. By October, the Starkville mine exploded, killing 56. At the Delagua mine in November, 79 workers died. Stingy owners limited interior mine sprinkling to dampen dangerously volatile coal dust. Safety regulations, such as they were, were not enforced, and immigrant miners did not always understand instruction in English. Mine owners specifically mixed immigrant groups on 12-hour work shifts so language acted as a barrier, diminishing the ability of miners to organize. If trouble arose, the powerful Colorado Fuel & Iron Co. of Pueblo, owned by John D. Rockefeller, controlled the mines as well as local politics and courts in Huerfano and Las Animas counties. Rockefeller refused to give raises. He refused to improve safety conditions, but he enjoyed visiting his company towns in his tidy dark bowler hat and long overcoat. He would toss shiny new dimes to immigrant children playing in dusty streets. President Woodrow Wilson would be forced to call out federal troops. Out of the carnage came a deeper understanding of industrial relations and the need for worker-management compromises. “Among the horrors of Ludlow, there was a glimmer of light: greater recognition that there is a unity of interest between labor and management,” says Rory Mullett, a Durango retiree whose career was in conflict resolution and human resources. Colorado Fuel & Iron refused to recognize the miners’ union. The exhibit “Children of Ludlow: Life in a Battle Zone, 1913-1914” is open at the El Pueblo History Museum in Pueblo, and the Trinidad History Museum commemorates a Greek union organizer in the exhibit “An American Icon: Louis Tikas and the Ludlow Massacre.” He was killed during the strike. Historical archaeology also teaches us lessons about the past. “Because the tent colony burned and was quickly abandoned on the day of the massacre, the archaeological record contains items that would not normally have been left behind or discarded in such a community,” says curator Dr. Karin Larkin. You can visit the Ludlow site off Interstate 25 just north of Trinidad. Think about the sacrifices made a century ago so that we can enjoy an eight-hour work day, safe working conditions and labor laws that allow for grievance procedures, mediation and arbitration. Real wages and buying power have steadily declined in America since the 1970s. The middle class continues to erode. As corporations and institutions squeeze employees over workplace issues and diminishing retirement benefits, a century after Ludlow, much remains to be done.